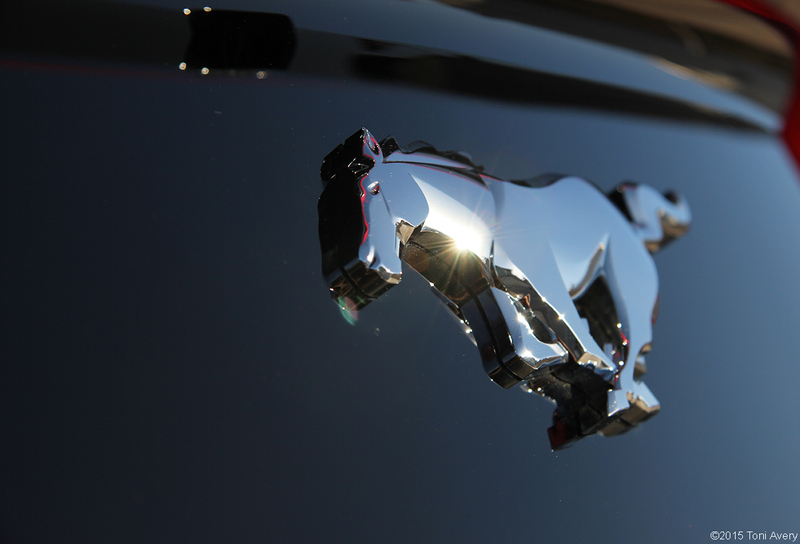 The Ford Mustang has seen many styling and engine variation changes over its fifty years in production. Some are still loved today as classics while others didn’t quite hit the mark. The 2015 iteration hits the mark in more ways than I can count. Receiving a much-needed styling change and the first ever implementation of an EcoBoost engine, this pony has set its sights on the likes of European sports car competitors in a big way. This Mustang is equipped with a 2.3 L 4 cylinder twin-scroll turbo charged engine producing 310 HP @ 5500RPM and 320 lb-ft of torque @ 3000RPM mated to a six-speed manual transmission. New to the 2015 model year is the implementation of Independent Rear Suspension, a much-needed and welcome upgrade. According to the Ford website, this EcoBoost produces more horsepower than the 2005 Mustang GT 4.6 L V8 with only half the displacement! If that isn’t progress I don’t know what is. 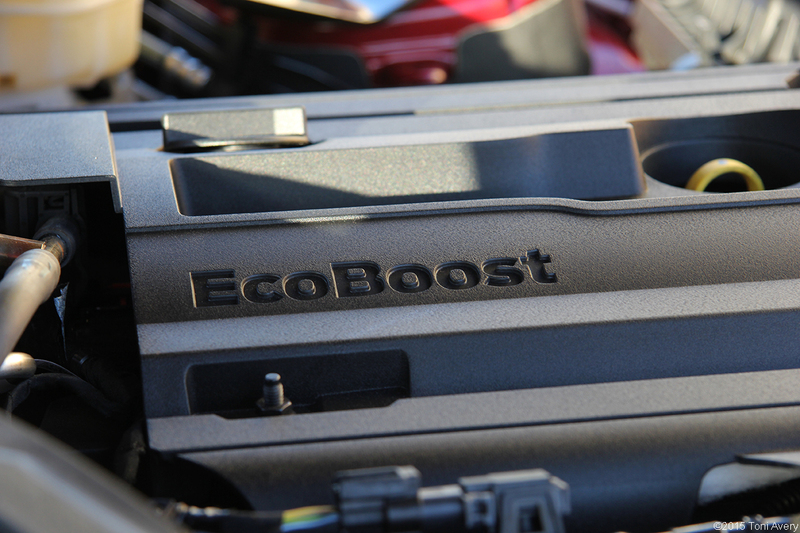 So before you doubt the output capabilities of the EcoBoost, take it for a drive, or take my word for it. It will blow you away. The torque curve in the EcoBoost seems to be very progressive which eliminates that feeling of waiting several thousand RPMs for the car to wake up and go. Putting the car into Sport Plus drive mode makes this feeling even more so. Drive modes come in a couple different forms. There’s Normal, Sport Plus, Track and Wet Weather. I tried out Normal and Sport Plus most in driving around town and my local canyon. You can feel a huge difference going from Normal to Sport Plus with quicker throttle response and an even sportier steering feel. I tried Track mode as well but didn’t push the car as hard simply because I wasn’t on a track because with this mode all driver assist functions such as traction control are turned off. For steering modes there’s Normal, Sport and Comfort. The difference between Sport and Comfort isn’t as drastic as going from Normal to Sport Plus in the drive modes but the difference is there. With Sport, more effort is required but there’s a lighter feel when turning the wheel and more road force felt through the wheel vs. less effort required yet a heavier feel when turning the wheel and less road force felt through the wheel. 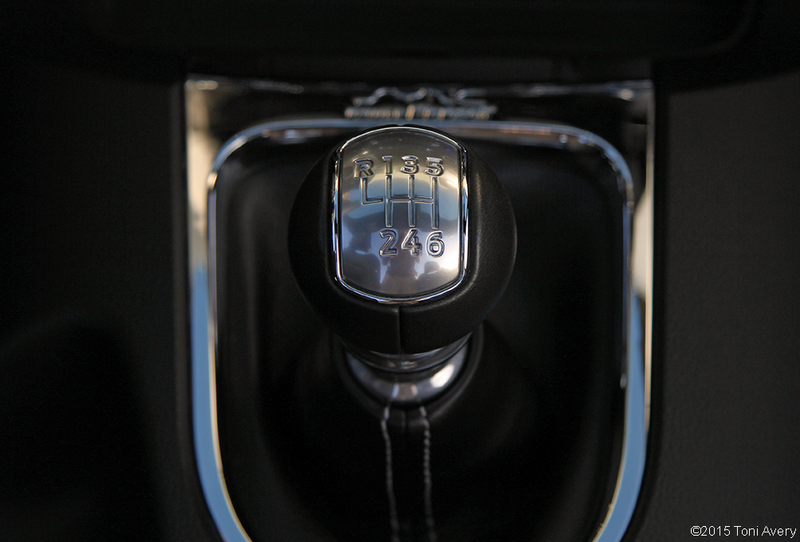 The manual transmission is also much improved over the last generation with smoother, more precise throws. While the engine isn’t as powerful or loud as the V8, it still emanates a nice note that won’t leave you wishing you’d purchased the GT. Now thanks to the upgraded rear suspension, the Mustang can now be considered a true sports car. 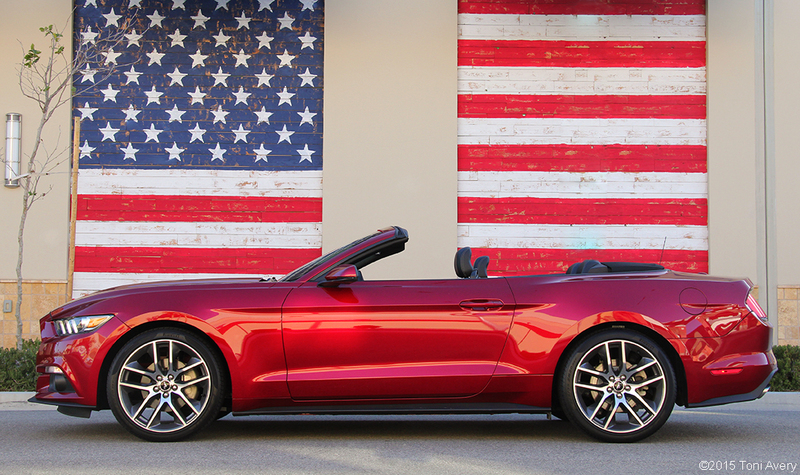 The exterior of this Mustang is finished in Ruby Red and a black folding soft-top. It sits on optional 20” Foundry black aluminum wheels wrapped in Pirelli P265/35R20 summer tires. The exterior styling change has been a long time coming. 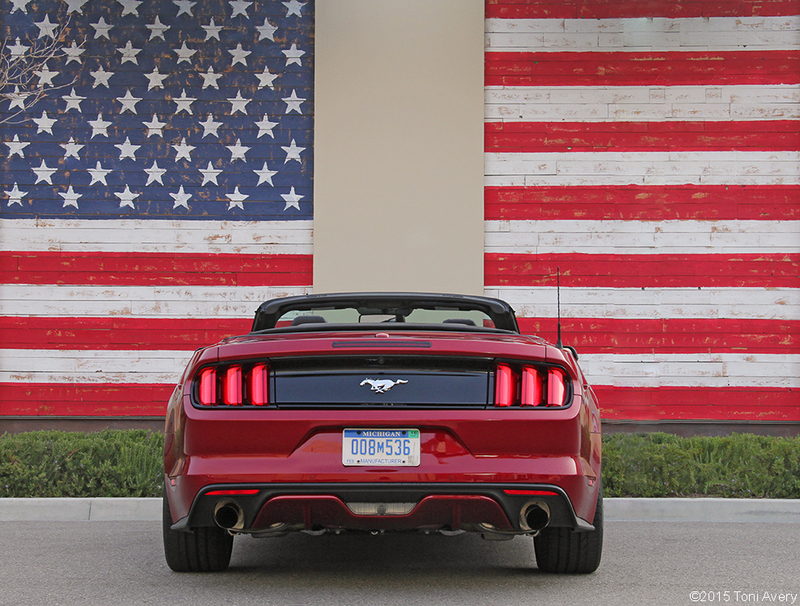 The rear of the car is one of the biggest changes with an entirely new look but still keeping that Mustang heritage with the triple tail lights. The front end looks to have been on a diet with a more sculpted appearance and more aggressive headlights. 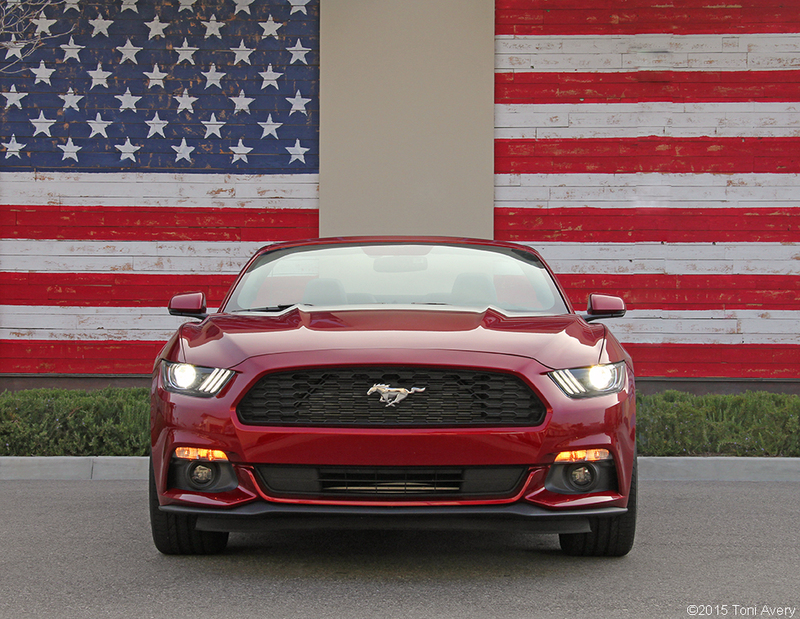 The new front-end look separates this Mustang from past iterations but in a positive and progressive way. It was time to modernize the design and I just love the way it looks going down the road. 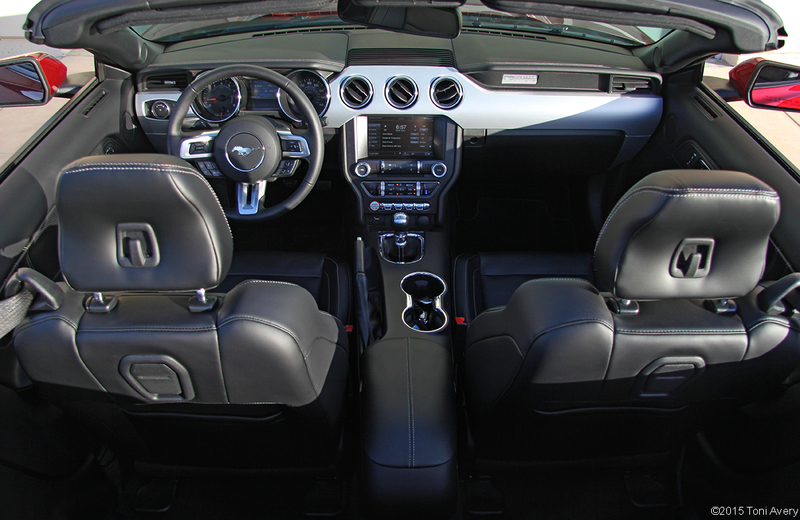 This Mustang is outfitted with black leather seats with white stitching, navigation, adaptive cruise control and heated/cooled front seats. 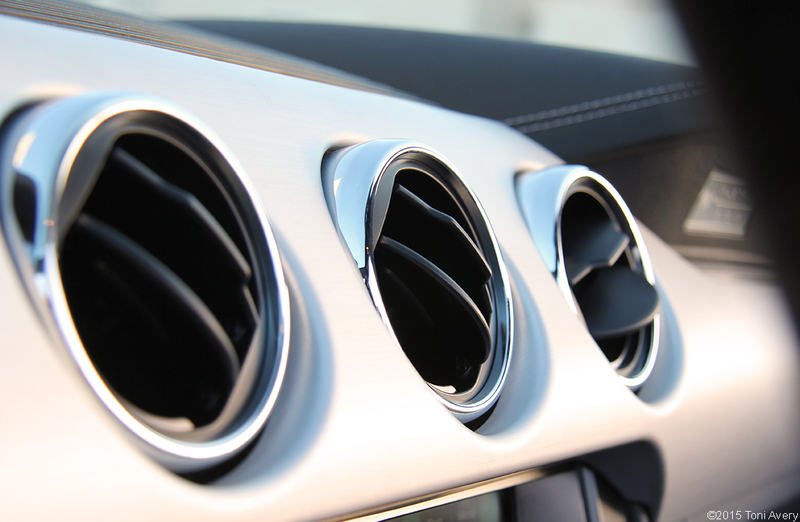 The inside of this Mustang is leaps and bounds ahead of the 2014 model just in terms of quality and fit and finish alone. Almost every surface is finished in a soft touch material and where there isn’t you’ve got other nice materials such as the metal finish on the dash. I was really impressed with the comfort of the seats and how well the heat/cool feature worked. A rear seat passenger expressed just how comfortable the back seats are but preferred to get into them with the top down. The top itself goes down in a matter of seconds and allows for a beautiful profile without the look of a bulky folded top. As much as I liked having the option to throw the top down, having it up at high freeway speeds created a wind flapping noise that was pretty annoying. If you don’t mind having the radio or music on all the time while on the highway, then you’re golden. Speaking of playing music, the optional Shaker Pro Audio System with 12 speakers gives off a really crisp and clear sound when either playing music or the radio. Even the trunk is a decent size for whatever you need to throw in or if you’re looking to take a short vacation. Perfect for long trips is the Adaptive Cruise control that’s optional on this car and does a great job of slowing and speeding up the car in light to moderate traffic conditions. The interior is a comfortable place to be whether you’re driver or passenger. 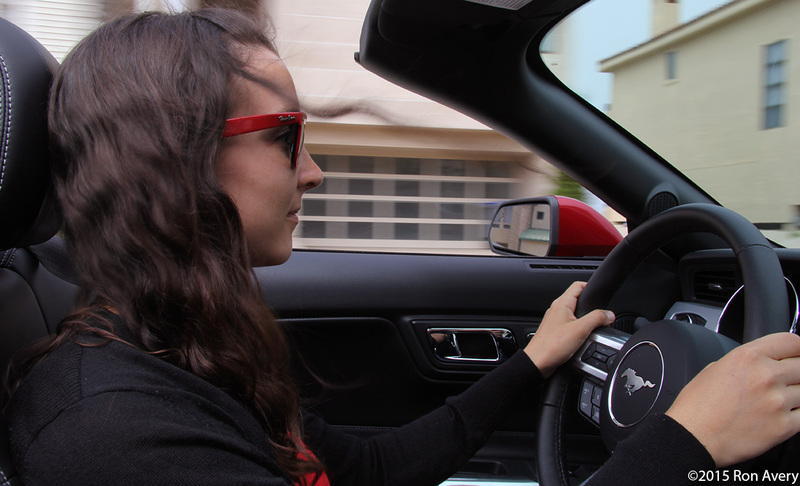 My time with the 2015 Ford Mustang EcoBoost Convertible was a fun one and I look forward to testing other Mustangs in the future. This is a wonderful choice for someone who doesn’t want to spend the extra cash on a GT but still wants a fun and powerful car. I’d personally opt for the EcoBoost but in a coupe.